In 19th century England people's drink of choice was limited by circumstance and their finances. The working classes tended to drink beer, ale, gin and cider; while the middle and upper classes drank wine and imported brandy. Wine was very strictly taxed and only the wealthy could afford to buy it. Some 80% of wine drunk at this time was sherry and port. 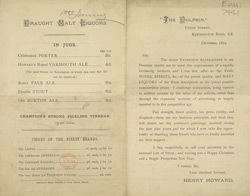 Adulteration of wine in the 19th century was common, with as much as one-fifth of the wine in England altered in some way.